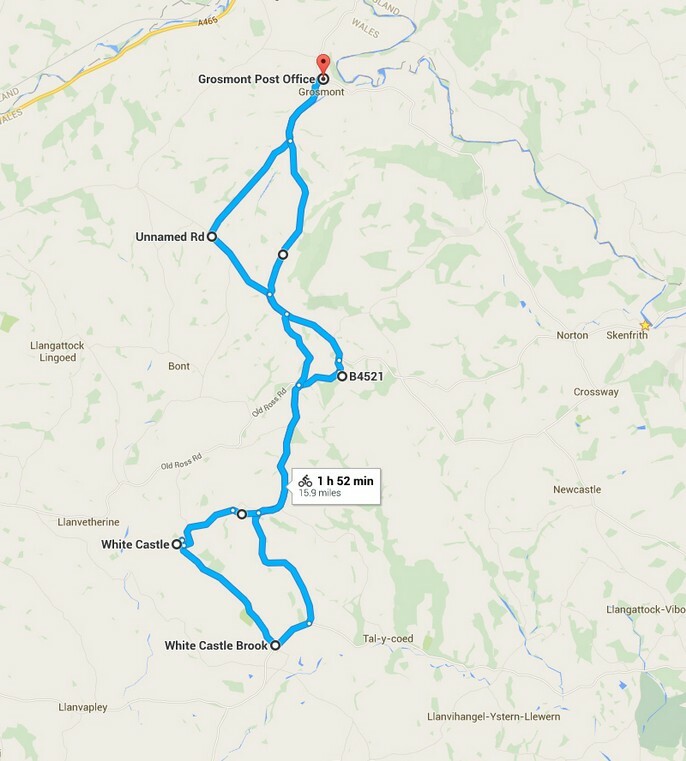 Stage 3 of The Castles Route to include loops to Grosmont Castle and Skenfrith Castle. This is a short, easy ride along quiet lanes with just a few hills but no overly-steep ascents. It is suitable for a family ride with free access to White Castle all year round. Start at Grosmont beside the Town Hall and Angel Inn to your left. Turn left following the direction sign of the Four Castles route, passing Poorscript Lane on the right. Cross Tresenny Brook and continue down the descent until reaching Little Hoaldalbert Farm on the left. Follow the 'Four Castles' route sign to the right, also signposted Pandy. Continue for 1.4 miles to the T junction and turn left towards Cross Ash, also following the NCC sign, with a cream-coloured bungalow across the lane on the right. Continue along this lane, looking back over the fields towards Grosmont to the left. After ascending the hill, you will soon be rewarded by stunning countryside and distant mountain views to the right then can enjoy an easy descent all the way to Cross Ash, passing Cross Ash Primary School on the right. At the T junction with Weaver's Cottage on your left, turn right, to join the B4512 towards Abergavenny. The road bends sharply to the left. Pass Cross Ash Farm on the left and the adjacent No Through Road then take the next turning on the left towards Brynderi and Llantilio Crossenny, a deviation from the signposted NCN Four Castles route. This quiet, almost traffic-free lane passes between hedged fields with a mix of mostly open countryside, a little woodland and views to the right towards the Welsh mountains. On reaching the T junction after 3 miles, turn right onto the B4233 towards Abergavenny. Shortly after reaching the Llantilio Crossenny/Llandeilo Greysynni sign, there is a sign hidden in the hedge on the right to 'White Castle, Ancient Monument, 2 miles'. Turn right following the direction of the sign with White Castle Brook flowing behind the hedge on the right. then continues 2 miles up to White Castle. Leave the castle and continue back to the lane taking the first turning on the left, now rejoining the Four Castles route, opposite the stone cottage on the right. and continue up the long, gradual incline for 0.8miles after which, take the first turning on the right, identified by the brick building set back from the lane. (If you miss this turning, simply take the next on the right which runs almost parallel!). The lane continues between hedges and rejoins the outward route. Turn left with the stone-walled cottage now to your right and in a short distance the parallel route will meet the lane, facing the stone wall. Continue along the lane, now retracing the outward route to join the B4521. On meeting the B4521, instead of turning right to retrace the earlier route, turn left onto the B4521 (towards Abergavenny) and then immediate right up a narrow unmarked lane. This passes between hedges providing welcome shade from the sun or respite from the wind and rain depending on the weather conditions. After 0.9 miles it meets the outward route to Cross Ash. Turn left at the T junction then take the first turning on the right, signposted Grosmont 2.5 miles. This follows the scenic return route to Grosmont along a quiet lane with panoramic, far-reaching views over open countryside to the left with the probability of just a little farm traffic, if any, but definitely worth giving way to a few tractors in order to stop and enjoy the views. Close to Grosmont, the lane rejoins the outward route at Hoaldalbert Farm. Pass the farm on the right and continue up the hill back to Grosmont to complete the ride.